A few weeks ago, Makezine & Craftzine introduced a new DIY platform called Make: Projects. Soon after the site launched, I jumped right in and started posting some of my project tutorials and playing around with the system. 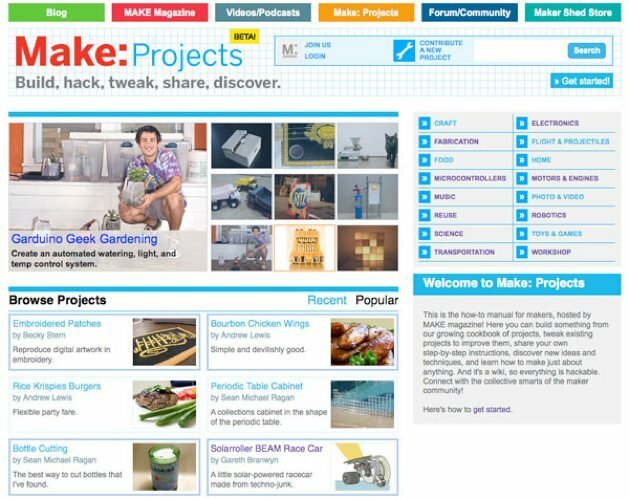 Make: Projects is a living library for makers, a how-to community hosted by MAKE magazine! Here you can build something from our growing cookbook of projects, tweak existing projects to improve them, share your own step-by-step instructions, discover new ideas and techniques, and learn how to make just about anything. And it’s a wiki, so everything is hackable. Connect with the collective smarts of the maker community! General Guide Data – input a title, choose a category for your guide, intro text, and a one line summary (that displays when browsing projects). Meta Data – display approximate time & difficulty of the project, prerequisites, and list the tools/materials needed. Steps - the ‘meat’ of the guide, where step-by-step instructions and images go. A really cool feature of the platform is the tools and material database in the Meta Data section of the guide editor. As you start typing a tool into the box, the database searches for it and you can choose from a drop down list. If the tool you input is not in the list, it gets added to the database, building a larger collection of relevant materials. The steps pages are created in a specific template, broken down into bullet points with icons that can be added for notes or reminders. This forces you to keep the steps short and to the point. As I was inputting tutorials I had previously published on Instructables, this constraint helped me clarify and condense instructions and make them easier to follow. One of my favorite aspects of the platform is the image tray. A pop up at the bottom of the screen, you can upload a bunch of images and drag and drop them into different sections of your guide. Once you use the image it is removed from the tray, but can be dragged back into it for rearranging. So how does the Make: Projects platform compare with the well known Instructables? It is hard to compare them side-by-side as they are essentially about different things. Make: Projects appears to be more of a library of tutorials introduced in Makezine and Craftzine, with the ability for users to contribute their own projects. It has more of a database/magazine feel and is for browsing, editing, and using as a reference. The strength of Instructables lies in its community and social emphasis on making. There are forums, comments, and ratings systems to help bring the most useful or engaging content to the forefront. One major difference to note is that on Make: Projects everything must be licensed underCreative Commons BY-NC-SA, while Instructables has the option of all Creative Commons licenses. I don’t favor one over the other and publish my tutorials on both to reach different audiences. It will be interesting to see how the two sites interact with each other. Standardized formatting keeps an easy to read and cohesive look/feel to the content. Wiki-based editing allows for guides to be continually improved upon. Curated platform helps eliminate duplicates and keeps a higher standard of projects. Only 3 images allowed per step. No option to embed video (yet). Thriving community adds a social aspect to the tutorials, commenting, contests and badges encourage interaction between users. Tagging, keywords, ratings, favorites and subscription options to organize your own priorities andenable dynamic browsing through related tutorials. Ability to add notes to images. Lots of ads can make interface crowded unless you purchase an upgraded account. No rules in place for formatting or image resolution – content/quality can be hit or miss. Click the image below to check out my author page on Make: Projects and view some of my tutorials.